We run a full Racing Program from March to November each year. Sunday afternoons and Thursday evenings are the principal racing times. We also run a bi-weekly “Frostbite” series in January and February. A full copy of the Sailing Program can be downloaded from the download section. Our Racing is organised on a Handicap basis to let different classes compete on a fair basis. While all members are free to use the water while racing is in progress, we do ask that members out cruising keep clear of the Races. A number of different classes of boat are currently racing regularly. Miracles, Streakers and Lasers are usually the largest fleets. Any other mono hull dinghy can be sailed on handicap. 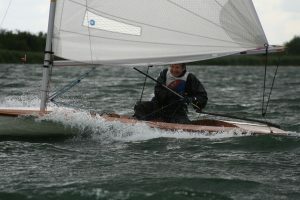 Racing at Welton is based on the RYA “Portsmouth Yardstick” system. The Handicaps are used in one of two ways. Pursuit Races, where a race runs for a fixed time, the slow boats start first and the faster boats are started at a time worked out such that they should just catch the slower boats at the finish time. The Race results is determined from the order of the boats on the water at the finish time. The remaining Races are run for a fixed distance, all boats start together and are timed over the race distance a corrected time is then worked out after the race to determine the winner. Within the Club, a number of special events and other trophies are organised each year. We try to offer something for everybody. From the experienced racer through to those new to the joys of sailing.